A visit to the opticians can be daunting, especially if it’s because you think your child needs glasses. But your optician is there to put you and your child at ease, and usually they end up feeling its one big adventure. Nowadays spectacles are not seen in such a negative light. 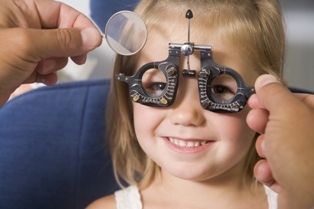 Eye examinations are important for your child’s healthcare and development. If children have poor vision it can hamper them at school and in everyday activities, they have no way of knowing if what they see is any different from others. It is important to get your child’s eyes checked before they start school. It doesn’t matter if your child is too young to read a letter chart as a qualified optometrist can use a range of techniques and modern equipment to detect visual problems at any age it is normal for children to have annual or 6 monthly check ups. The NHS offer free eye tests to all children under 16 and full-time students under 19. If your child does need glasses you will receive a contribution towards the cost. It is a legal requirement for under sixteens to have their glasses fitted by a qualified dispensing optician, we have 4 of these on our staff.